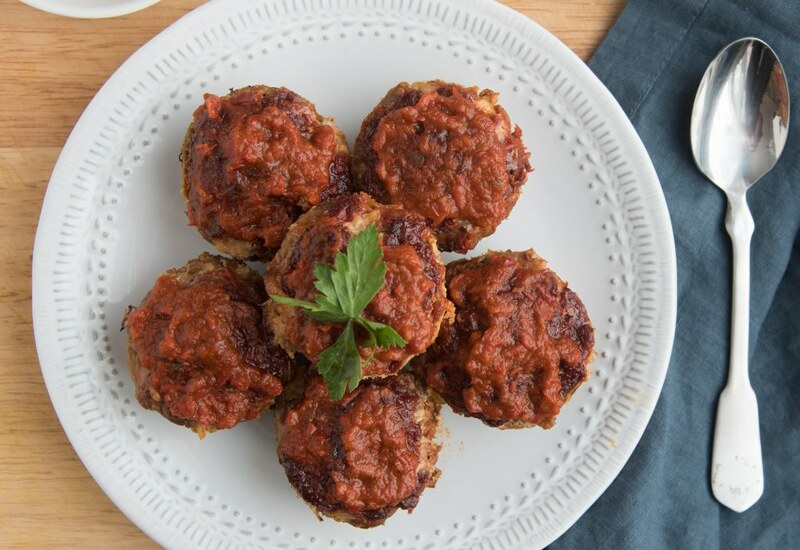 Make these flavorful and moist miniature meatloaves for your next dinner party. This recipe is also kid-approved! Instead of ketchup, these meatloaves use a combination of red pepper jelly and pomegranate molasses. They are mixed together and a portion is used in the meat mixture. It is combined with ground turkey, onion, eggs, walnuts, and parsley. The rest of the red pepper jelly and pomegranate molasses combination is spooned on top of each mini meatloaf to give it a beautiful and flavorful glaze. They cook up quickly when made in a muffin tin. Planning ahead for future meals? Make a bigger batch and freeze for up to three months. Red pepper jelly is a sweet yet spicy condiment that adds incredible flavor to these meatloaves. Pomegranate molasses is simply pomegranate juice that has been reduced down, with or without sugar, to a thick, intensely flavored syrup. It can often be found in the Middle Eastern section of the grocery store. Per Serving: 371 calories; 21g fat; 23.4g carbohydrates; 23g protein; 142mg cholesterol; 193mg sodium. This guilt-free recipe is perfect for a lunchtime meal prep. I wasn't sure about the pomegranate molasses working as I am used to a BBQ or ketchup sauce, but it gives off a well-balanced sweet and tart flavor to this savory dish. Also, everyone should have red pepper jelly on hand for most dishes (even just topped on scrambled eggs). It's a great alternative to ketchup and the heat is just right. Super easy mini meat loafs. I'm used to eating it with ketchup, but the red pepper jelly was a good substitute. I'll probably make these again for game day!